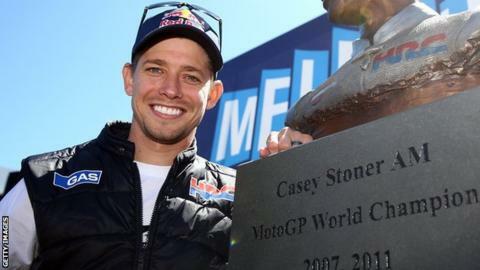 Two-time MotoGP world champion Casey Stoner is set to return to former team Ducati as an ambassador and test rider. The 30-year-old Australian, who won the title with Ducati in 2007, will begin his new role next year. Stoner left Ducati in 2011 to join Honda, winning a second title in his debut season, and testing for them since retiring in 2012. "The opportunity to work with Ducati again is something very special," said Stoner in a Ducati statement. "It's been a great journey with HRC over the last five years. Winning the World Championship in 2011 was obviously a high point and I've made many friends and formed lasting relationships along the way. "The Ducati brand and the Ducati fans have been such a big part of my career and my life, so it will be really great to reunite the relationship and start another chapter with this iconic brand."